This review shootout is for all the motocrossers, mountain bikers, skiers, surfers, boarders, bladers, racers and extreme walkers. 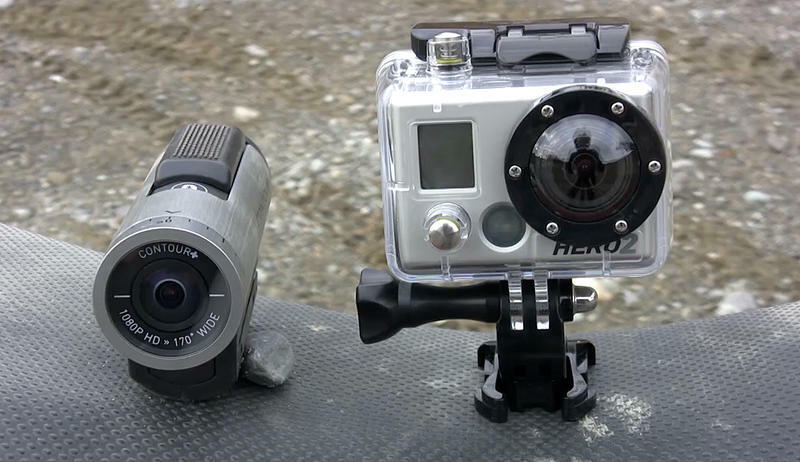 It's the GoPro HD Hero2 vs. Contour's flagship Contour+ in this action cam fight to the finish line. Which POV cam will prevail? Start up your engines and wax those boards because it's time to find out! In round one of our action cam shootout, we're taking a look at the structural integrity of both models. The GoPro HD Hero2 and Contour+ survived a hellish slapshot, so durability was about equal. However, the Contour+ doesn't ship with a waterproof housing while the GoPro does, and that's a major issue. The Contour+ is definitely sexier with its brushed metal design, rotating lens and large, intuitive Record switch. And while to GoPro HD Hero2 retains that same brick-like architecture was saw on the original GoPro, the little brick's design is more versatile. There's a record lamp on the top, bottom, front and back now, as well as a revamped LCD monitor that's easier to read. The Contour+ lacks a built-in LCD of any sort. Both cameras feature Mic jacks, though the Contour Plus has a smaller proprietary jack that requires an adapter while the HD Hero2's is a 3.5mm hole. The HD Hero2 also records to SD/SDHC/SDXC cards while the Contour+ relies on puny MicroSD cards. I chose the GoPro HD Hero2 over the Contour+ when it came to design. The Contour+ is alluring, thanks to its GPS capability. Contour also offers the Contour GPS at $300, so if you don't need all the bells and whistles the Contour+ has to offer, then the GPS is the way to go. The Contour+ also has Bluetooth connectivity, which meant I was able to download the Contour application to my iPhone and use it as an external LCD monitor in order to see exactly how the camera was mounted. The GoPro HD Hero2 did not have a live LCD monitor unless I used the BacPac adapter, which can be purchased as a separate accessory. For controls, the Contour+ had the ability to alter the White Balance and a few other adjustments, but without an LCD menu system, it was beyond vexing to have to rely on button combinations. The HD Hero2 had exposure metering and a few other options and it was super easy to adjust, thanks to the camera's LCD menu system that was improved via the BacPac accessory. One other thing to mention here is that both cameras have removable LI-ion batteries, though the GoPro HD Hero2 supports an external battery pack that can plug into the back for extended juice. In this category, it's a tie between the GoPro HD Hero2 and Contour+. Next to image quality, this might be the most important department, for what good is an action cam if you can't mount it anywhere? I found that both models had their advantages and disadvantages. First off, the Contour+ benefits from a low center of gravity and has a rotating lens configuration. I could lay the camera flat on its side or keep it upright and the rotating lens allowed me to maintain a horizontal recording plane. Also, the camera's quick-release groove system was fairly convenient when compared to the HD Hero2's nut and bolt configuration. The Contour+ could also be oriented a full 360-degrees, thanks to its rotating base mounts. 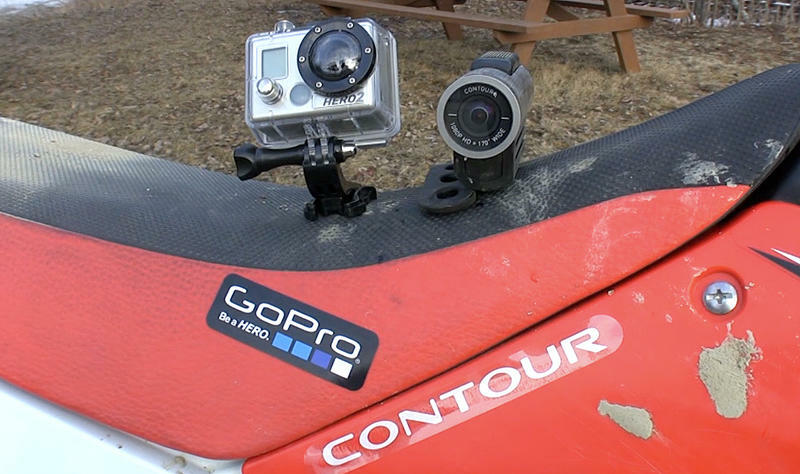 The only downside to the Contour+ was that it could not be tilted forwards or backwards like the GoPro HD Hero2 unless you buy the Contour helmet mount system. The GoPro shipped with oodles of attachments, including a suction cup mount and head strap while the Contour offered a head strap and a few other bits right out of the box. This is another tie because your needs may vary, depending on the type of application you'll be mounting the camera to. For a prime example, check out the hockey puck cam section in the review video above. And now the moment you've all been waiting for! 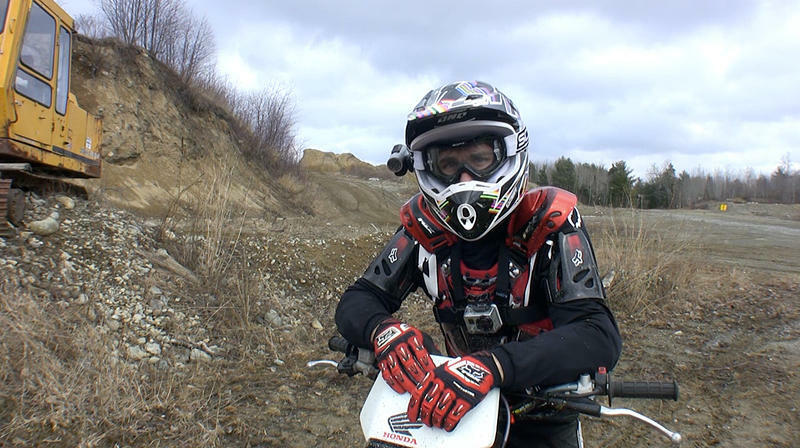 I had heard that the Contour+ was capable of some magical things when it came to its HD video quality, but the GoPro HD Hero2 lightly trounced it through all of my testing sessions. I found the Contour+ to be too soft and warm. It lacked detail and needed a better Auto White Balance system. I also experienced the infamous "jelly video syndrome" with the Contour during the hockey puck test while the GoPro did not exhibit that problem to the same extent. The GoPro HD Hero2 on the other hand was amazing. The company truly did improve the original HD Hero's sensor and the results were unreal. Sharpness, detail and color were right in the sweet spot. The GoPro HD Hero2 actually has an 11-megapixel 1/2.3-inch CMOS sensor, which can be found in entry-level and intermediate point-and-shoot cameras to this day. The Contour+ has a 5-megapixel sensor that is shared across all three Contour models, regardless of the price. The GoPro HD Hero2's photo mode was more versatile and the pictures rivaled some fairly advanced point-and-shoot cameras as well. The Contour's interface was so vexing that I gave up trying to find the Photo mode. In this most prestigious battle, the GoPro HD Hero2 wins. Be sure to check out the 1080p video samples from each camera after the conclusion. 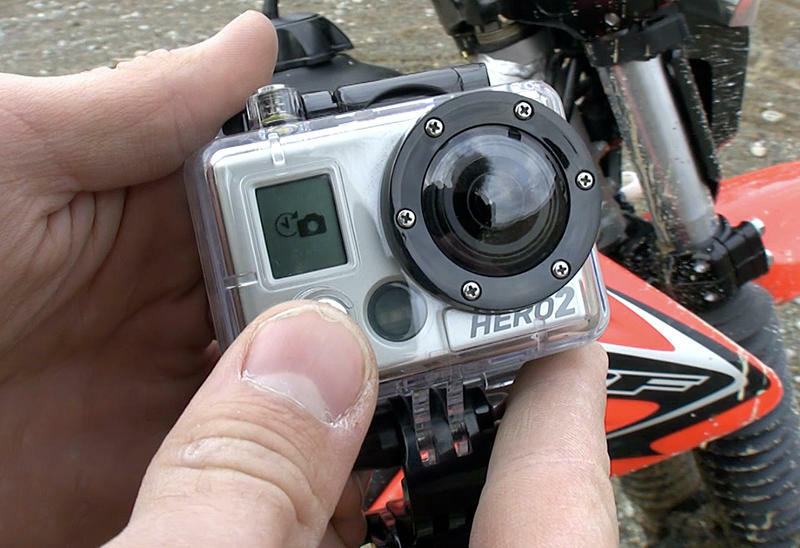 At the end of a fun-filled powersports and winter games showdown, the GoPro HD Hero2 prevailed. It offered superior image quality, ease of use (thanks to the LCD system and revamped menu) and was well-equipped right out of the box. I expected a bit more from the Contour+ when it came to image quality, and its lack of built-in LCD and waterproof housing were two of its primary detriments. Although both cameras performed well, there could only be one winner. 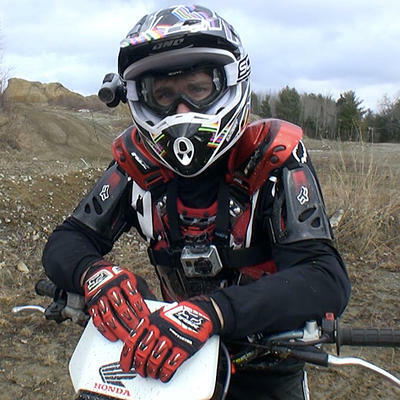 The GoPro HD Hero2 will remain mounted on my dirt bike and hockey helmet while the Contour+ will be assigned as the designated hockey puck cam.